I am a little overwhelmed. I have about 30 amazon tabs open right now and do not know where to begin. Hila is nearing the four month mark and so it is time to introduce to her the next necessary toy in her developmental range: The Exersaucers. Or the Jumperoo. Definitions: Exersaucers are big round plastic playgrounds. 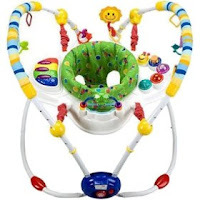 The baby sits in a seat, can swivel around to different activity centers, can rock, bounce, and spin, and can activate lots of annoying lights and noises. 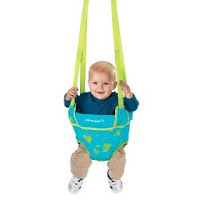 Jumperoos either hang from a door or from two ends of a metal frame and provide lots of bounce for the baby, lots of good leg and core exercise, and often also have lots of toys and lights and noise (but usually less than the exersaucer). So how to choose? Well, I'm not really sure. At first glance, I like the jumparoos better. They seem less....creaky. All that plastic on the exersaucer makes the whole experience seem a bit clunky, whereas the ride on the jumperoo seems smoother and quieter. All that being said, I've still pulled out a few of each that have caught my eye. 1. 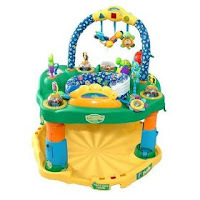 Evenflo SmartSteps Exersaucer Entertainer - This is your classic saucer with lots of music options, removable and replaceable toys, and a compact fold. 2. 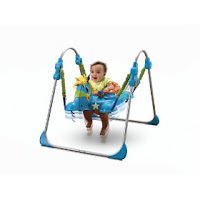 Baby Einstein Musical Motion Activity Jumper - This jumperoo has a little mini piano on this. Of course, all the reviews on Amazon say that it breaks, but that Baby Einstein is good about replacing parts. And while I don't usually like overly musical and busy baby things, this one seems cute and if the baby is actually "making" music and not just hitting buttons that do all the work, then it actually seems productive. Swivels 360 degrees, just like in an exersaucer. This is a jumparoo that is set in a frame, not on the door. That seems like a safer, more secure option. 3. Fisher-Price Galloping Fun Jumparoo - This one has none of the bells and whistles of the other jumparoo/exersaucers, but is definitely the cutest. It's a jumping rocking horse! Also, in a frame, not for the door. 4. Johnny Jump Up - The old-fashioned, door-hanging jumparoo. I had one of these when I was a kid. There's a picture of me somewhere. I look pretty happy. This one is by far the cheapest ($20) and has no added toys or electronics. Do you have one? Do you recommend it? Why or why not? No, I don't have either. I considered them at the time too, but considered for so long that I no longer needed one. You see, they are useful for such a small period of time (in the grand scheme of things) that unless you are mega wealthy or have loads and loads of floor space (and storage space for later), then I wouldn't really bother. They are hugely bulky. In fact, none of my friends got one, so I can't really argue the other side of the coin - sorry! Although one of my friends did have one of those door bouncers, and she used it while she was on the computer that happened to be next to the door, but you can't use them for more than about 20mins I think because they are bad for their backs. You just need to get by in this interim period before your baby is sitting by themselves. Because let's face it, as soon as they are sitting by around 7 months, you can just put them on the floor with all their toys around them. And give them lots of tummy time cos that gets them crawling and then the world is their oyster and they have lots to do. It keeps them sitting upright before they can themselves and they can't escape either (till they are a bit more mobile and then they lean backwards out of them, but anyway...) What I did was sit her in one and put a couple of her toys on the floor next to her leaning up against the Bumbo so she could reach them. Also I had a really large playmat with a toy arch above it and I would lie her so she could reach the toys hanging closer to the floor. And I wouldn't worry about their legs needing exercising. They get plenty of that when they are learning to crawl and my daughter did at about 8-9 months perfectly efficiently, then she cruised round the room, then she was walking at 12-13 months without needing a jumparoo at all. But it's up to you. Every child is different and some just need that extra level of entertainment so maybe it would be worthwhile for your little one. I do recommend Bumbos though - they look a bit odd, like a giant potty!! But will def get one of those for my next child! We have one of those exersaucer things - similar to the classic one you listed first, and you are welcome to borrow it :). Liz is right, it IS bulky, and "compact fold" is relative. I also don't remember Eden being that entertained by it, and Ben was never too thrilled about tripping over it in the living room. But then, we have all sorts of things like that..
never used one. plonked yonah on a huge playmat for ages from 3 months with loads of toys, and he started crawling before 5months. We used a pack and play filled with toys when he had to be confined. He went to gan at 7 months anyway, so not worth buying if she is going to start in September. So Bethami lent us her Evenflo exersaucer and it's not one with bells and whistles and Hila IS a little too small, but looks like it'll be fun once she grows into it a bit! Liz, I love that bumbo chair. Email me (sarahpritzker@gmail.com) -- I'd love for you to post! We don't have room for an exersaucer in this apartment. Maybe in the new house, but then we'd have no room to store it. I'd consider borrowing one, I guess, if anyone in Jerusalem has room for one. We have a Johnny Jump-up. The kids liked it (or at least one of them did), but not for long stretches of time, and not for more than a couple of months. I had a cousin who could play in it forever, she loved it more than anything. But personally, unless you can get it really cheap, I don't know if I would bother. Ours was a gift from my in-laws, and it doesn't take up much space, so I don't mind keeping it.